May Jeong – whose excellent investigation of the US air strike on the MSF Trauma Centre at Kunduz I’ve commended before – has a new, equally enthralling extended report over at the Intercept on the sole survivor of a US drone strike in Kunar province in eastern Afghanistan on 7 September 2013: ‘Losing Sight‘. It’s a long, rich read, but there are two issues I want to highlight. First, May captures the stark, bio-physical horror of an air strike with an economy and force I’ve rarely seen equalled. As I’ve noted before (see here and here), many critical analyses emphasise the bio-convergences that animate what happens behind the digital screens of the kill-chain and say remarkably little about those that lie on the other side. It’s all too easy to lose sight of the embodied nature of remote warfare, though in another powerful essay Joseph Pugliese argues that it’s often not possible to speak of the corporeal at all in the face of such catastrophic violence: ‘The moment of lethal violence transmutes flesh into unidentifiable biological substance that is violently compelled geobiomorphologically to assume the topographical contours of the debris field’ ( ‘Death by Metadata: The bioinformationalisation of life and the transliteration of algorithms to flesh’, in Holly Randell-Moon and Ryan Tippet (eds) Security, race, biopower: essays on technology and corporeality (London: Palgrave, 2016) 3-20). [T]hey saw the husk of the pickup, strafed and lit up in flames. They hurried toward the fire. At first, it was just Mohibullah, another driver named Hamish Gul, and three villagers from Quroo who came to help. Most people in the area knew to stay away. The ghanghai [drones] often attacked again. Even so, the five of them worked at untangling the dead bodies — among them Aisha’s mother, father, grandmother, and little brother — and stacking them in neat rows atop the bed of Mohibullah’s truck. Read those paragraphs again to see what Pugliese means. Her stomach was missing, as were parts of her face and her left arm. He registered her into the hospital database, writing “acute abdominal injuries” next to her name, treated her with basic first aid, and sent her to the nearest hospital in Jalalabad, 57 miles away. 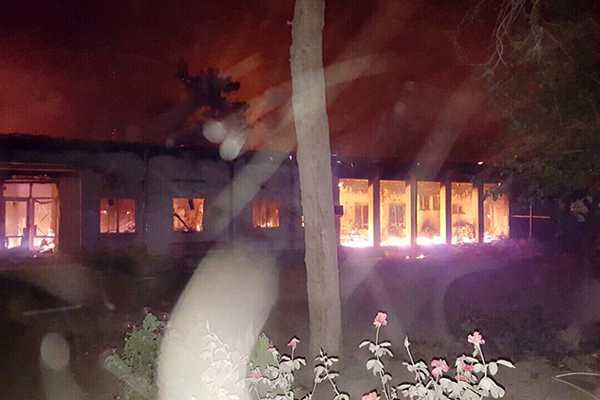 Aisha reached Jalalabad Public Health Hospital shortly after midnight, where her burns were dressed. But here too there was little the surgeon could do; she had multiple head injuries, had lost one of her hands, and had major internal injuries. A helicopter was called to take her to Kabul but it couldn’t land; a second helicopter arrived at midnight – 24 hours after she had reached Jalalabad – and ferried her to the French military hospital at Kabul Airport. That hospital was a NATO Role 3 hospital, which had been run by the French since July 2009; by the summer of 2013 43 per cent of the procedures carried out by its staff had involved orthopaedic surgery. 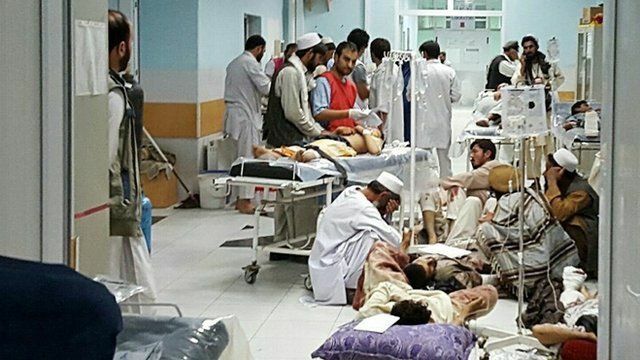 Half of these were emergency surgeries; just 17 per cent of the patients were French military personnel and another 17 per cent were Afghan National Army or other ISAF soldiers, while 47 per cent were Afghan (adult) civilians and 17 per cent were children. Like other Role 3 hospitals, the facility was tasked with ‘damage-control’, for which it could call on three surgical teams rotation with a general surgeon, (abdominal, chest or vascular surgery) and an orthopedic surgeon as well as an ophthalmologist, a neurosurgeon and an ENT or maxillofacial surgeon (I’ve taken these details from O. Barbier and others, ‘French surgical experience in the Role 3 Medical Treatment Facility of KaIA (Kabul International Airport…’, Orthopaedics and Traumataology: Surgery & Research 100 (6) (2014) 681-5; see also Christine Joubert and others, ‘Military neurosurgery in operation’, Acta Neurochir 158 (8) (2016) 1453-63). There, Karzai was confronted with a girl who had lost her sight, her nose, her lower lip, the skin on her forehead, the skin on her torso, her left hand, and nine members of her family, including her grandmother, her uncles, her aunts, her cousin, her mother, her father, and her baby brother. “I cannot describe what I saw there,” Rangin Spanta, who served as national security adviser under Karzai and accompanied him to the hospital that day, told me from his home in Kabul. We were sitting on a rattan set on his front porch. In telling this story, Spanta covered his face and wept. “Still I have my trauma.” Spanta had lost five family members in the war, but the sight of Aisha, a girl who had been reduced to a “piece of biological construct,” gave him “the feeling that this was a kind of a nightmare.” Spanta, who had seen the guts of suicide bombers splattered across his car window and has visited double, triple, and quadruple amputees, said Aisha was the “most shocking thing I’ve seen in this war.” Karzai asked the attending doctor why her face was covered. “Because there is nothing there” was the answer. 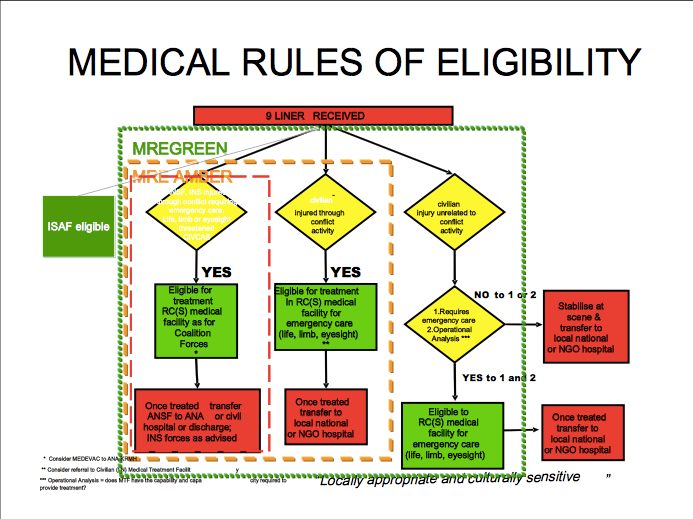 That a high proportion of patients the military hospital were Afghan civilians was by no means unusual for a Role 3 facility, but as I’ve noted before ISAF had strict Rules of Medical Eligibility. Afghan civilians who were injured during military operations and/or needed ‘life, limb or eyesight saving care’ – both of which applied to Aisha – could be admitted to the international medical system. But as soon as possible, Afghans were to be treated by Afghans and so, after surgical intervention, they had to be transferred to the local healthcare system. Some of the most difficult decisions taken by the Deployed Medical Director related to local patients, Afghans civilians, their families and others. Locals made up the majority (probably as much as 80 per cent) of the patients cared for during the lifetime of the hospital. During the war there were no Afghan hospitals with the technology or capability to ventilate patients with severe chest wounds, therefore leaving Bastion meant death. So anyone intubated who could not be returned to Britain had to stay at Bastion until they could breathe unaided, which sometimes took days or weeks. They were discharged only when it was certain they could survive away from Bastion: probably in a local hospital that was under severe stress, and which could only provide medical care for two or three hours a day, where the rest of the time they would be looked after by their families. I’ll return to this in a later post, because in some cases those local hospitals have been supplemented and even supplanted by more advanced medical facilities operated or supported by international NGOs like Emergency or MSF. But what is extraordinary in Aisha’s case is that her pathway did not follow any of these routes. Karzai had asked both the French and the Germans to help, but they deferred to the Americans who insisted that she be taken to the United States for further treatment. ‘Twelve days after the strike,’ May reports, ‘Aisha was gone’: but nobody ever told her relatives what had happened to her. Every attempt they made to find out was rebuffed. Each Summer Solace for the Children Summer Medical Program brings children from areas affected by war to the United States so they may receive medical care unavailable to them in their country. We currently focus our efforts on children in Afghanistan. Each fall, applications are accepted for treatment. Our office in Afghanistan typically receives more than 50 applications they must review and qualify. Youth are qualified for services based on need and health condition. They are then placed with a host family for approximately 6 weeks while receiving the medical care they require. After care, youth return to Afghanistan with a better quality of life, brighter future and hope for peace. Those last sentences are becoming all too familiar, but in this case ISAF not only acknowledged the ‘IM [international military] aerial attack’ but carried out its own investigation into the civilian casualties. It has never been declassified. 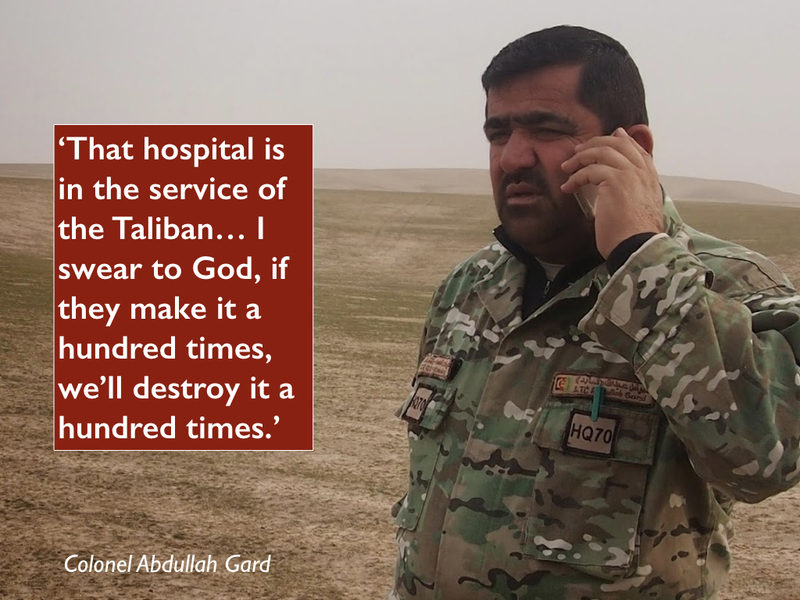 This is the third in a new series of posts on military violence against hospitals and medical personnel in conflict zones. 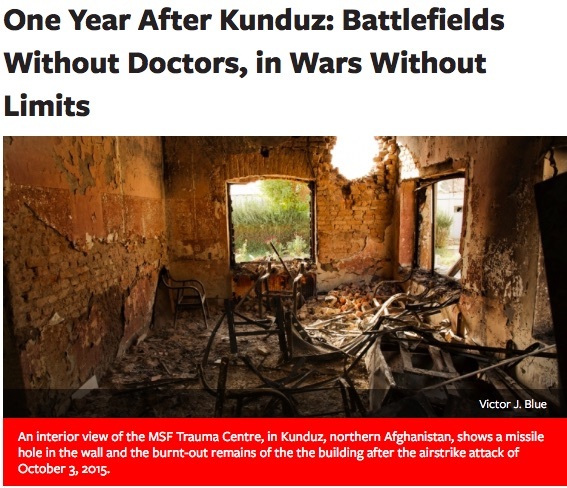 It examines some of the key issues arising from the US attack on the Trauma Centre run by Médecins Sans Frontières (MSF) in Kunduz on 3 October 2015; it follows directly from my detailed analysis of the attack here and prepares the ground for a still more detailed analysis of attacks on hospitals, doctors and casualties in Syria to follow. 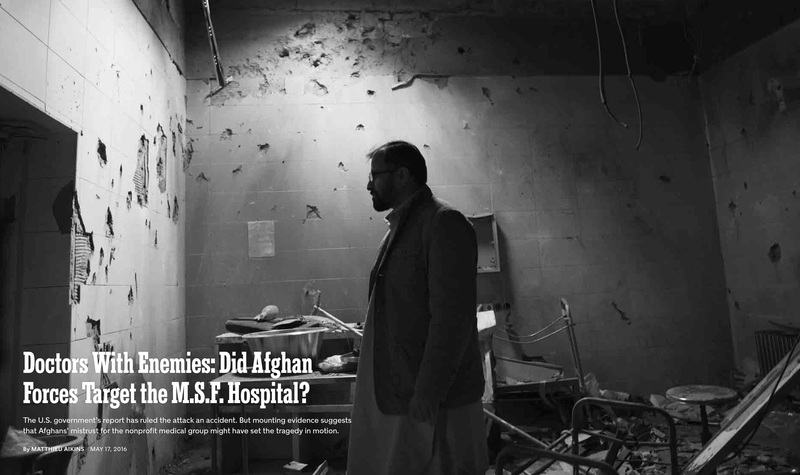 There are at least four main issues arising from the US attack on the MSF Trauma Centre in Kunduz that spiral out into a wider argument about what I will later call ‘The Death of the Clinic’. I’m treating ‘the clinic’ here as a topological figure that extends from the body of the wounded through the evacuation chain to the hospital itself. The clinic has been accorded a privileged status within the space of exception that is the modern conflict zone – a complicated, fractured space in which killing is made permissible subject to the protocols of international humanitarian law – so that the clinic becomes an exception to the exception and its inhabitants granted a conditional immunity from attack. It’s important to understand that this legal armature is not immutable, and that changes (and challenges) to it arise through both (geo)political and military actions; international humanitarian law is not a deus ex machina, somehow above the fray, but is thoroughly entangled with the prosecution of military violence. More on this to come, but for now it will be enough to list some of the major protections accorded to the clinic in war-time. Ambulances and military hospitals shall be acknowledged to be neuter, and, as such, shall be protected and respected by belligerents so long as any sick or wounded may be therein. Such neutrality shall cease if the ambulances or hospitals should be held by a military force … A distinctive and uniform flag shall be adopted for hospitals, ambulances and evacuations. … all necessary steps must be taken to spare, as far as possible, … hospitals, and places where the sick and wounded are collected, provided they are not being used at the time for military purposes. It is the duty of the besieged to indicate the presence of such buildings or places by distinctive and visible signs, which shall be notified to the enemy beforehand. Civilian hospitals organized to give care to the wounded and sick, the infirm and maternity cases, may in no circumstances be the object of attack but shall at all times be respected and protected by the Parties to the conflict. 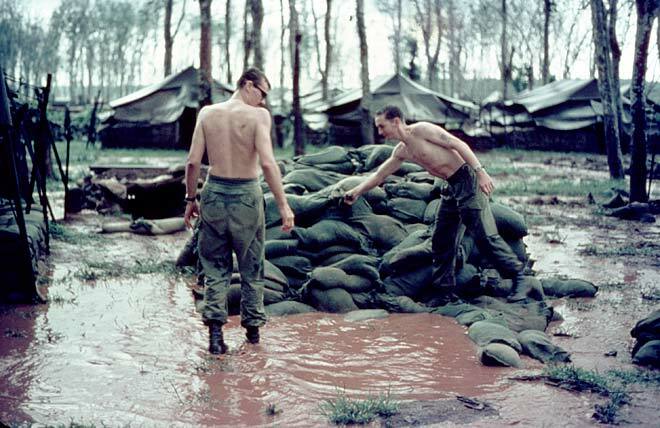 The protection to which civilian hospitals are entitled shall not cease unless they are used to commit, outside their humanitarian duties, acts harmful to the enemy. Protection may, however, cease only after due warning has been given, naming, in all appropriate cases, a reasonable time limit and after such warning has remained unheeded. The fact that sick or wounded members of the armed forces are nursed in these hospitals, or the presence of small arms and ammunition taken from such combatants and not yet been handed to the proper service, shall not be considered to be acts harmful to the enemy. The language and specifications change, but there is nevertheless a consistent thread running through these provisions. It has been stretched – and perhaps broken – by the attack on the MSF Trauma Centre, and here I’ll focus on four issues that have proved contentious. First, the visual identification of the Trauma Centre; second, the alleged breach of its conditional immunity; third, the construal of the attack as a war crime; and fourth, the putative rejection of medical neutrality altogether. 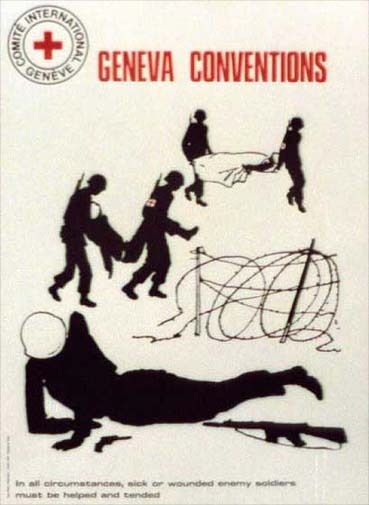 Ask yourself: wasn’t it a mistake for [MSF] – and a serious one – not to have marked its facility in accordance with Protocol III to the Geneva Conventions which designates “the only emblems recognized by nations signifying the protected status of individuals or objects bearing them during armed conflict”? Had, for example, the hospital been marked with large Red Crosses/Red Crescents or one of the other internationally-recognized symbols (as the U.S. does) or something that would make its protected use clear from the air, isn’t it entirely plausible that the aircrew (or someone) might have recognized the error and stopped the attack before it began? Put another way, isn’t it foreseeable that in an exceptionally chaotic combat situation (where a belligerent is making use of civilian buildings to conduct combat operations) that mistakes could occur in identifying a protected structure absent Protocol III markings or at least something to make it identifiable at a distance, especially when it’s known that attacking aircraft are being used? Wouldn’t reasonably prudent persons have marked their medical facility with an internationally-recognized symbol or something of similar clarity to the warring parties? Wouldn’t due care demand it in that situation? In accusing MSF of ‘imprudence’ and even recklessness Dunlap applies a double standard. He repeatedly insists that the US and the Afghan militaries confronted ‘an extraordinarily intense situation’ in Kunduz, that they faced ‘terrible urgency’ and ‘enormous pressure’ as they operated ‘in the turmoil of a war zone’ – all of which is undoubtedly true – but he uses this to excuse their mistakes while refusing to extend the same privilege to MSF. 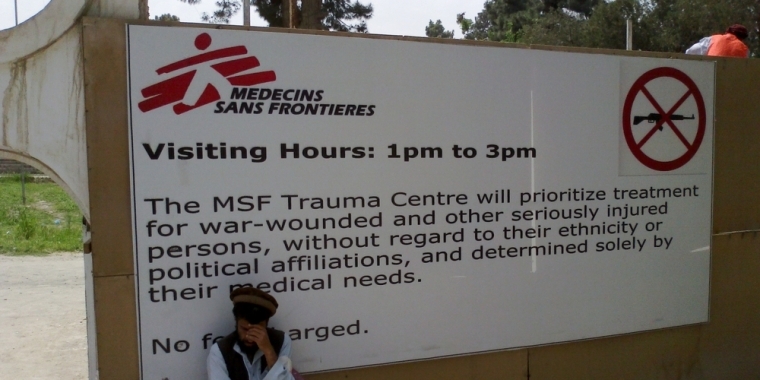 In any case, MSF had clearly ‘indicated their presence’ to both the US and Afghan authorities by providing them with the GPS co-ordinates of the Trauma Centre (see my previous discussion here). Dunlap finds this ‘commendable’ but ‘legally problematic’. Instead, he is fixated on the absence of a Red Cross flag from the roof, in which case he might reflect on another passage from the report. 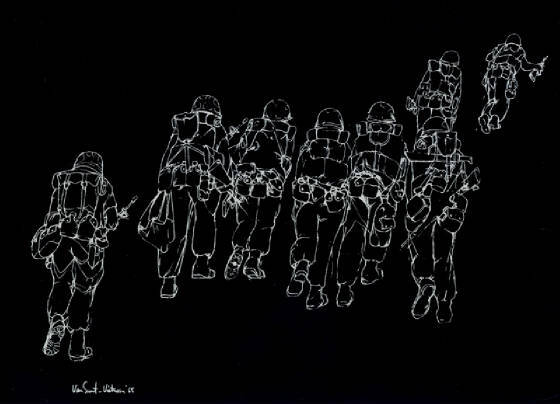 On 2 October, the day before the air strike, MSF phoned the Special Operations Task Force in Bagram to develop a contingency plan: while the Taliban were respecting the neutrality of the Trauma Centre and ‘treating the government casualties well’, they wanted to know the feasibility of extracting their patients should conditions deteriorate. During that conversation they were advised to ‘take the signs normally affixed to the sides of the trucks and to install them on the top of the vehicles for easy identification by aircraft during this or any future MSF resupply operations‘ (503; my emphasis). This surely makes it clear that the US military anticipated no difficulty in recognising MSF’s flag and logo as symbols of medical neutrality. IHL makes it clear that treating wounded combatants does not compromise the protections afforded to a medical facility; that occurs only if it is used as a base from which ‘to commit, outside their humanitarian duties, acts harmful to [one of the belligerents]’. I’ll address the intervening clause – ‘outside their humanitarian duties’ – under (4) and confine my discussion here to the alleged militarisation of the clinic. 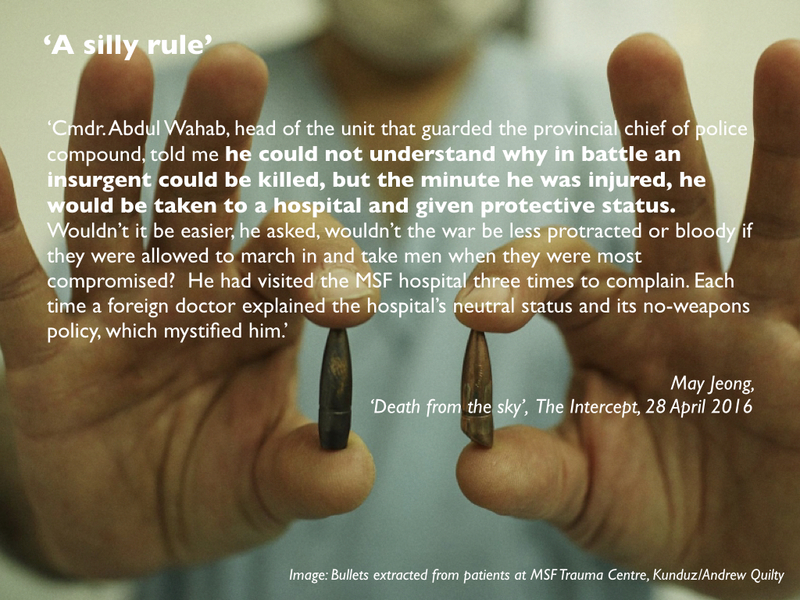 All of the MSF staff reported that the no weapons policy was respected in the Trauma Centre. [Since the KTC opened, there were some rare exceptions when a patient was brought to the hospital in a critical condition and the gate was opened to allow the patient to be delivered to the emergency room without those transporting the patient being first searched. In each of these instances, the breach of the no weapon policy was rapidly rectified.] 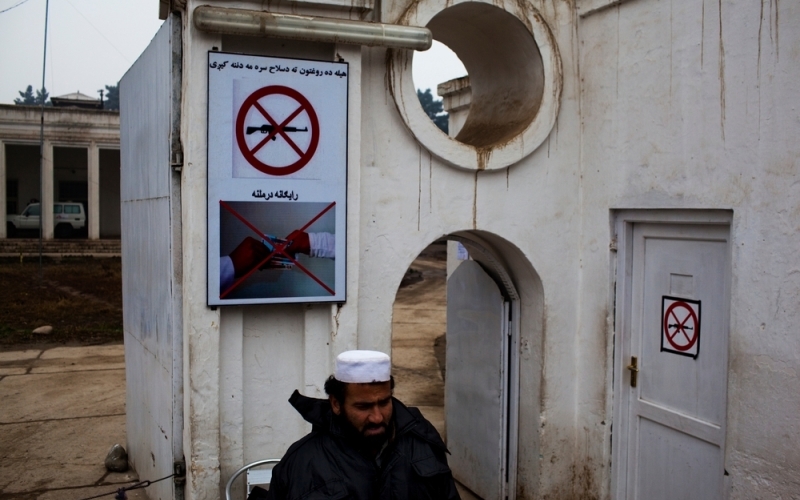 In the week prior to the airstrikes, the ban of weapons inside the MSF hospital in Kunduz was strictly implemented and controlled at all times and all MSF staff positively reported in their debriefing on the Taliban and Afghan army compliance with the no-weapon policy. Evidence provided to the investigation team supports the MSF internal initial report’s characterization that their no-weapons policy was adhered to with rare exceptions (038, note 15). Aikins goes on to report that patients were allowed to retain their cellphones, and some of their caretakers retained hand-held radios whose transmissions were intercepted by Afghan special forces. They in turn concluded that not only were the Taliban inside the hospital but were using it as a base: ‘They had raised their flag and established their headquarters there.’ On 1 October, presumably in response to these reports, the Pentagon contacted MSF in New York to ask whether ‘they had a large number of Taliban “holed up”’ in the Trauma Centre, and were assured that the only Taliban inside the hospital were wounded patients. But the suspicions clearly remained, and festered to such a degree that some of those on the ground were convinced that the hospital had been overrun by Taliban fighters. 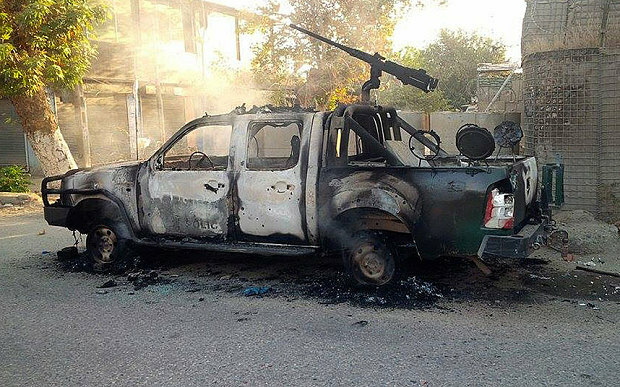 Associated Press reported that the radio intercepts prompted US analysts to request ‘specific intelligence-gathering flights over the hospital’ – their outcome has never been disclosed – and on 1 October a senior Special Forces commander (whether in Kabul or in Kunduz is unclear) wrote in his daily log that the Trauma Centre was under Taliban control and that he planned to clear it in the coming days. 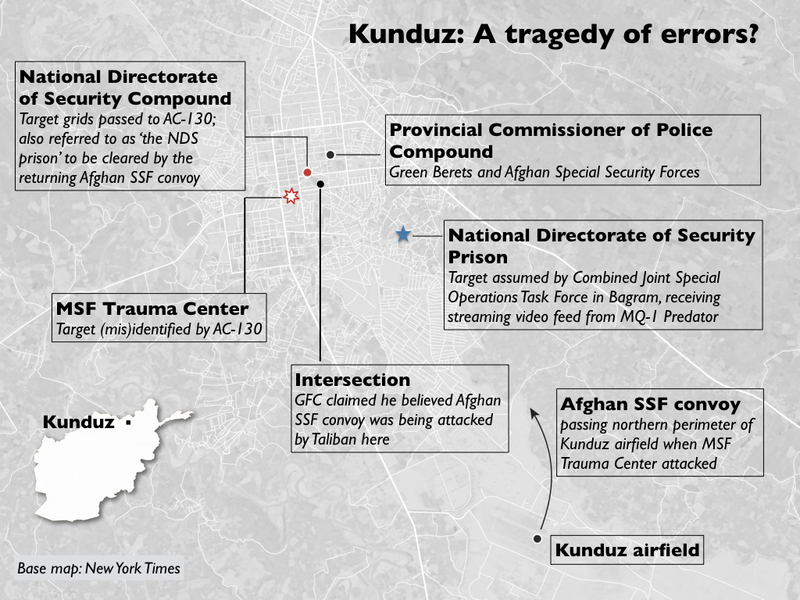 At least some of the Green Berets in Kunduz agreed with his assessment: ‘They were using it as a C2 node … They had already removed and ransomed the foreign doctors, and they had fired on partnered personnel from there.’ Indeed, after the attack a senior US officer in Kabul was told – by whom has been redacted – that ‘there were three dead Military-Aged Males near the hospital, identified as Taliban by the local population. They were using the hospital as a command post (using its protected status)’ (275). But all of this was fantasy, and the investigation discounted it. 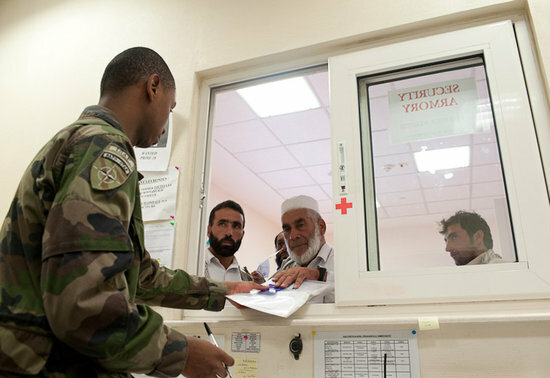 Although US intelligence reported that insurgents were present at the hospital at the time of the strike, the investigation accepted that this was for medical treatment and they could trace ‘no specific intelligence reports that confirm[ed] insurgents were using the MSF Trauma Center as an operational C2 [command and control] node, weapons cache or base of operations’ (085). 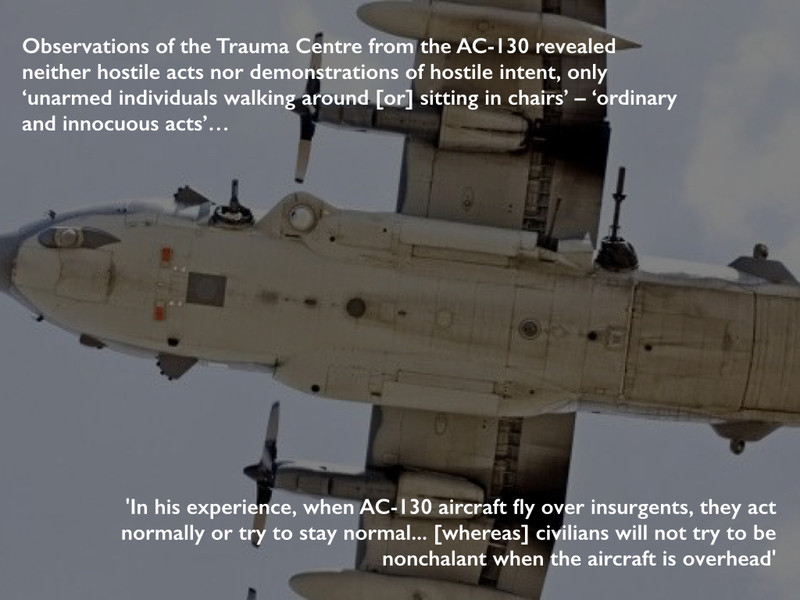 In addition, they determined that observations made from the AC-130 revealed neither substantive hostile acts nor demonstrations of hostile intent – only ‘unarmed individuals walking around [or] sitting in chairs’ (085). The report describes these as ‘ordinary and innocuous acts’ (055), but to at least one member of the aircrew that was in itself grounds for suspicion: ‘In his experience, when AC-130 aircraft fly over insurgents, they act normally or try to stay normal… [whereas] civilians will not try to be nonchalant when the aircraft is overhead’ (093, note 304). Damned if you do, and damned if you don’t: when everything is construed as hostile, even the most innocent acts are transformed into somcething sinister. But of course they did deny it: repeatedly, emphatically and convincingly. 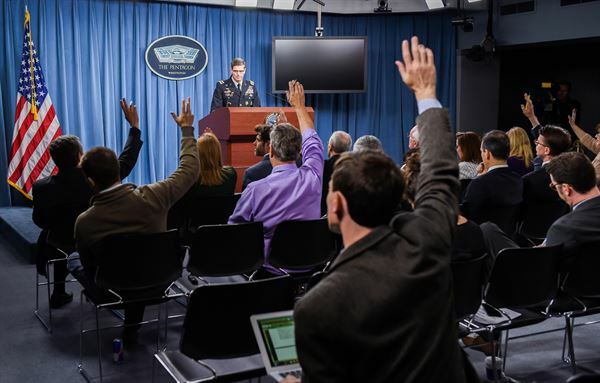 The US military investigation was unequivocal: it found multiple violations of the military’s own Rules of Engagement and of international humanitarian law. The parties to the conflict must at all times distinguish between civilians and combatants. Attacks may only be directed against combatants. 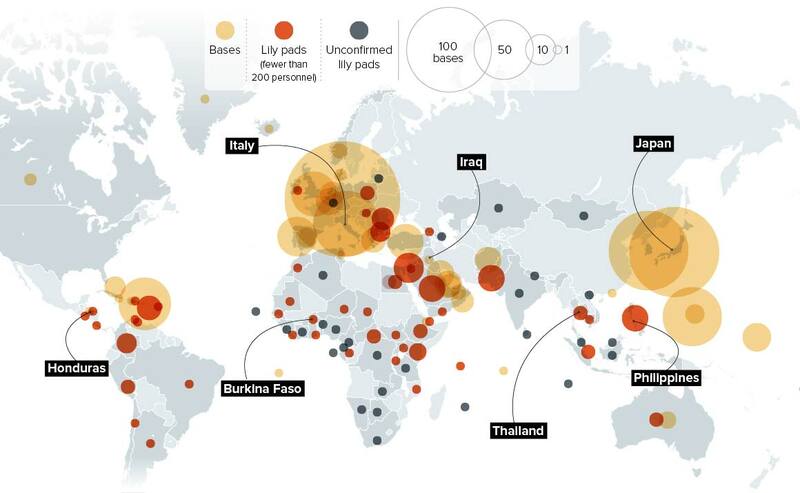 Attacks must not be directed against civilians. Neither commander distinguished between combatants and civilians nor a military objective and protected property. Each commander had a duty to know, and available resources to know that the targeted compound was protected property’ (075-6). Launching an attack which may be expected to cause incidental loss of civilian life, injury to civilians, damage to civilian objects, or a combination thereof, which would be excessive in relation to the concrete and direct military advantage anticipated, is prohibited. The GFC and the aircraft commander failed to exercise the principle of proportionality in relation to the direct military advantage (076). The obligation to refrain from use of force against a medical unit acting in violation of its mission and protected status without due warning does not prohibit the exercise of the right of self-defense. There may be cases in which, in the exercise of the right of self-defense, a warning is not “due” or a reasonable time limit is not appropriate. For example, forces receiving heavy fire from a hospital may exercise their right of self-defense and return fire. Such use of force in self-defense against medical units or facilities must be proportionate. Not only was there was no evidence of hostile let alone ‘heavy fire’ from the Trauma Centre but the AC-130 was also monitoring the progress of the Afghan Special Forces convoy that it was tasked with protecting and knew perfectly well that it was still within the perimeter of the airfield. This was not a time-sensitive target (the report makes that crystal clear) and neither the GFC nor the aircraft commander had reason to believe that any putative threat to Afghan or US forces was so grave and so sustained that it called for an air strike involving multiple passes by the AC-130 – over 30 minutes according to the US military, an hour according to MSF – delivering such intense fires that the building was virtually destroyed. For these reasons many commentators – and MSF (‘Under the clear presumption that a war crime has been committed, MSF demands that a full and transparent investigation into the event be conducted by an independent international body’) – have insisted that the attack was a war crime. the investigation did not conclude that these failures amounted to a war crime. The label “war crimes” is typically reserved for intentional acts – intentionally targeting of civilians or intentionally targeting protected objects. The investigation found that the tragic incident resulted from a combination of unintentional human errors, process errors and equipment failures, and that none of the personnel knew that they were striking a medical facility. The report has been so heavily redacted so that this legal discussion is unavailable (see also the commentary by Sarah Knuckey and two of her students here). We do know that the investigation team included an unnamed legal advisor from US Central Command (CENTCOM) and that its report was subject to legal review by the Staff Judge Advocate, who accepted its findings as ‘legally sufficient’ with several, redacted exceptions – though there is no way of knowing what they were (007-009). We know too that General John Campbell, who ordered the investigation as commander of US Forces in Afghanistan, subsequently disapproved a number of findings and recommendations ‘not related to the proximate cause of the strike’ (002) but, again, the details have been excised. The problem is that the killing of the innocent civilians was not intentional, it was accidental. As a matter of criminal law, it was either reckless or negligent … but the civilian killings were not performed with purpose. The Rome Statute of the International Criminal Court provides for war crimes prosecutions for ‘intentionally directing’ or ‘intentionally launching’ attacks that contravene international humanitarian law (in effect, criminalizing the rules of IHL). Jens discusses this in relation to attacks on civilians, but the Statute also proscribes ‘intentionally directing attacks against buildings, material, medical units and personnel’ or against ‘personnel, installations, material, units or vehicles involved in a humanitarian assistance or peacekeeping mission’. CENTCOM would have been better served by acknowledging that intent was not required [for the commitment of a war crime], but that awareness of risk was distributed among many organizational components, without full awareness concentrated in one or more individuals who could be charged criminally. I noted above that hospitals only lose their protected status if they are used ‘to commit, outside their humanitarian duties, acts harmful to [one of the belligerents]’. It’s a telling provision because its intermediate clause can be read as a tacit acknowledgement that those humanitarian duties – treating the sick and wounded – could otherwise be construed as acts harmful to their enemies. 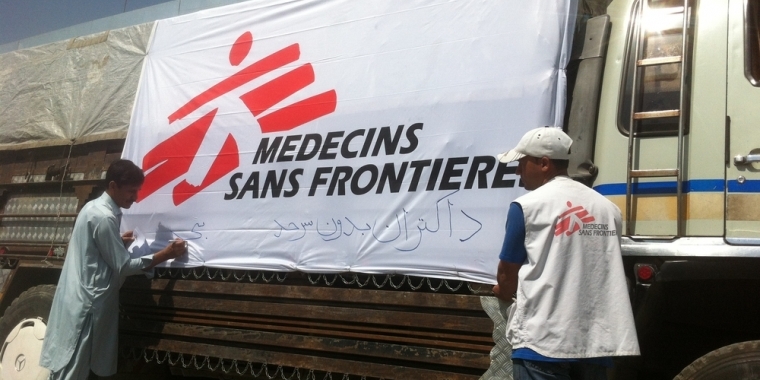 Gard spoke of MSF with the personal hatred reserved for the truly perfidious. He accused the group of “patching up fighters and sending them back out,” a line I heard repeatedly. Cmdr. 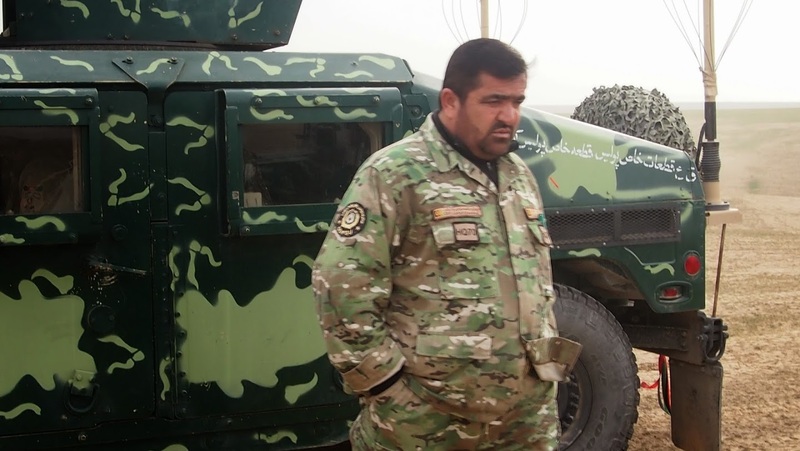 Abdul Wahab, head of the unit that guarded the provincial chief of police compound, told me he could not understand why in battle an insurgent could be killed, but the minute he was injured, he would be taken to a hospital and given protective status. Wouldn’t it be easier, he asked, wouldn’t the war be less protracted or bloody if they were allowed to march in and take men when they were most compromised? He had visited the MSF hospital three times to complain. Each time a foreign doctor explained the hospital’s neutral status and its no-weapons policy, which mystified him. In short, it seems that some (perhaps many) in the Afghan security forces – particularly after the humiliation of being forced out of Kunduz – believed that the Taliban were legitimate targets wherever they were and that the fight against them was being hamstrung by what one officer described to Jeong as a ‘silly rule’. This becomes material because, as I showed previously, the intended target for the air strike was a National Directorate of Security compound whose co-ordinates had been passed to Major Michael Hutchinson, the Ground Force Commander, by Afghan Special Security Forces (who, like him, were unfamiliar with the city): they had identified the NDS compound as a Taliban command and control node, and planned to clear it on their return from the airfield following a casualty evacuation. The AC-130 was supposed to provide Close Air Support, but a series of technical difficulties compromised the accuracy of its sensors and several hours after the Afghan Special Security Forces had left in an armoured convoy with their three casualties the aircrew were still unsure of the location of the target and so requested a verbal description of the NDS compound. 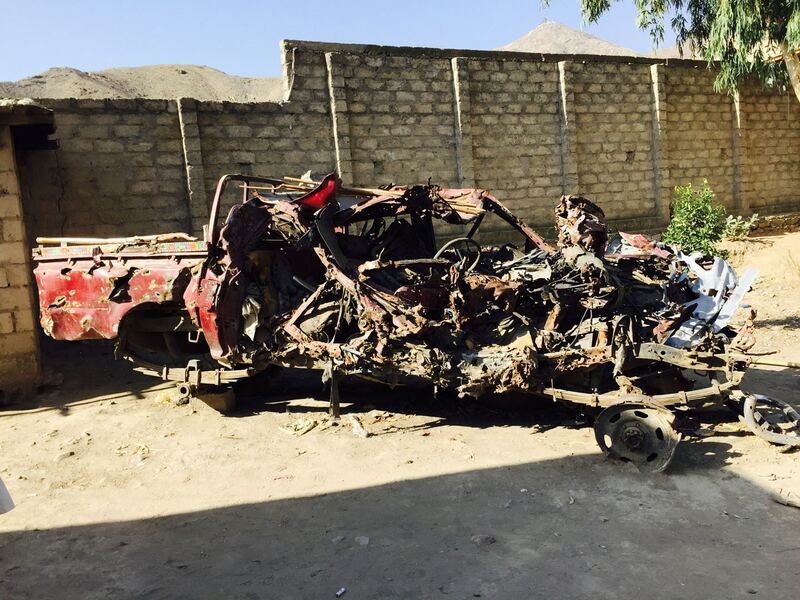 This was provided by Afghan forces still inside the Provincial Chief of Police compound: their description matched the MSF Trauma Centre much more closely than the NDS compound, and the aircrew fixed on this as their target. The health worker’s claim to impartiality may itself be a stance against the state’s insistence that it is the sole arbiter of who can live and who can die. 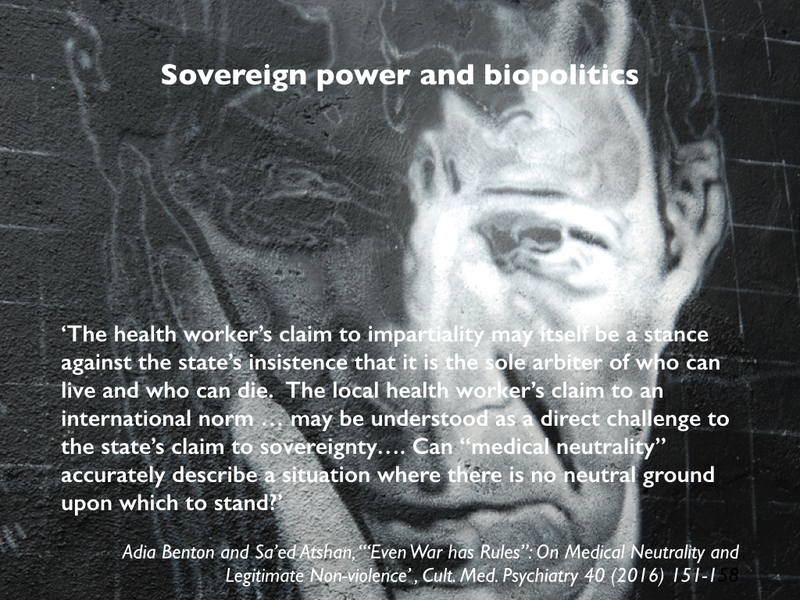 The local health worker’s claim to an international norm … may be understood as a direct challenge to the state’s claim to sovereignty…. Can ‘‘medical neutrality’’ accurately describe a situation where there is no neutral ground upon which to stand? (‘‘‘Even War has Rules’’: On Medical Neutrality and Legitimate Non-violence’ , Cult. Med. Psychiatry 40 (2016) 151-158). As the spectral presence of Giorgio Agamben in my slide below implies, this has the liveliest implications for how we are to understand the space of exception and the refusal of its victims to be reduced to the passivity of ‘bare life’. 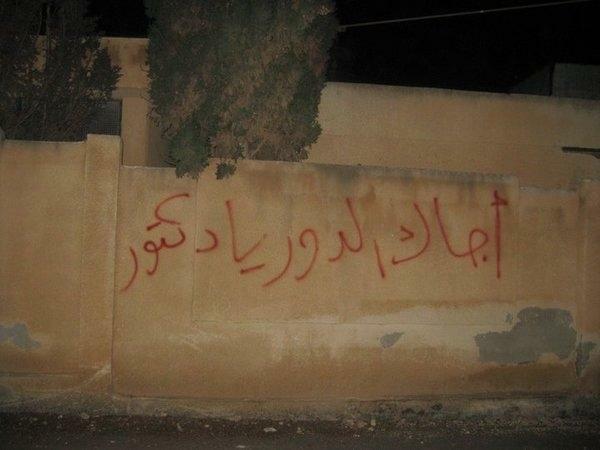 As I will show in the next post in this series, Syria is the most egregious contemporary case. If some members of the Afghan security forces wilfully misled the Americans into targeting the MSF Trauma Centre in Kunduz, then it seems clear that they objected to the protection extended by IHL to wounded Taliban combatants and those who treat them (though many of those killed in the attack were civilians, despite Alan Dershowitz‘s tawdry attempt to suggest that MSF ‘favoured Taliban fighters over civilian patients’: see Kevin Jon Heller’s magisterial response here). 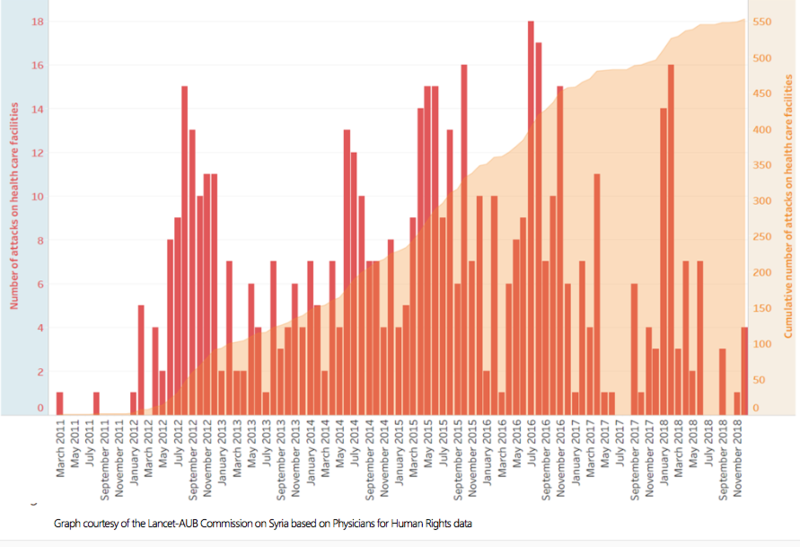 But in Syria not only has the provision of medical aid to those in rebel-held areas been explicitly criminalised by the state’s new Counterterrorism Law which came into effect in July 2012 – the space of exception is far from being a ‘legal “black hole” – but the ban extends to those providing medical aid to sick or wounded civilians. And make no mistake: there have been no mistakes. The murder of doctors and nurses and the bombing of hospitals and clinics in Syria has been deliberate and systematic. The exception to the exception contracts to its vanishing point.